Poland's Prime Minister Mateusz Morawiecki responds to controversy over bill to outlaw mention of Polish involvement in Holocaust. 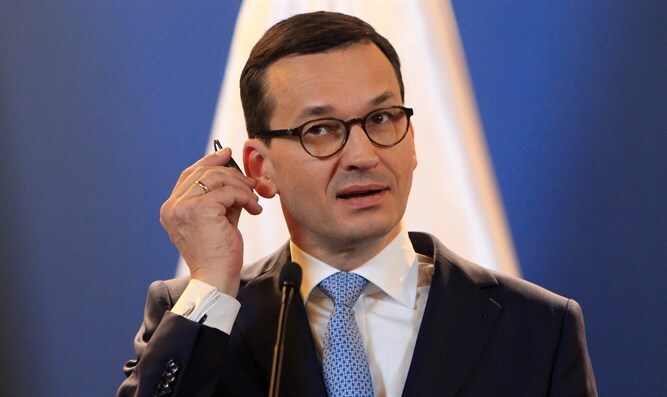 Poland's Prime Minister Mateusz Morawiecki responded on Saturday night to the controversy surrounding the bill outlawing any reference to the Nazi death camps in the country as being Polish. Earlier on Saturday, Prime Minister Binyamin Netanyahu criticized the bill, saying, "The law is baseless; I strongly oppose it. One cannot change history and the Holocaust cannot be denied." "I have instructed the Israeli Ambassador to Poland to meet with the Polish Prime Minister this evening and express to him my strong position against the law," he added. President Reuven Rivlin responded to the law as well, saying, "'One cannot fake history, one cannot rewrite it, one cannot hide the truth. Every crime, every offence must be condemned, denounced, must be examined and exposed.' This was stated in the Knesset by former Polish President Aleksander Kwaśniewski." Education Minister Naftali Bennett instructed schools to dedicate two hours this week to study about the involvement of European nations in the Holocaust. "It is also a historic fact that the Germans initiated, planned and built the work and death camps in Poland. That is the truth, and no law will rewrite it. These facts must be taught to the next generation," added Bennett.